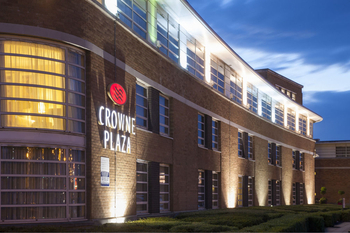 A quick reminder that today (Monday) is the last day to book in IHG’s short flash sale for Crowne Plaza, Holiday Inn, Holiday Inn Express, Hotel Indigo and Staybridge Suites hotels in the UK and Ireland. You need to be an IHG Rewards Club member to book, but sign-up is free. As these rates are non-refundable, it isn’t really fair to say it is a 25% discount. You’d normally get 10% off compared to the Best Available Rate for booking a non-refundable room, so the additional discount will be nearer 15%. Still better than nothing though! Don’t forget to register for the Autumn IHG Rewards Club promotion as well. The new offer is called Double Points Plus More. It runs from 16th September to 16th December. You earn double base points from your 2nd stay, up to a maximum of 15,000 bonus points. There are additional personalised targets which could be worth a lot more. This is my article on the Double Points Plus More offer. You can register on the IHG site here. The booking page for the UK and Ireland flash sale is here. 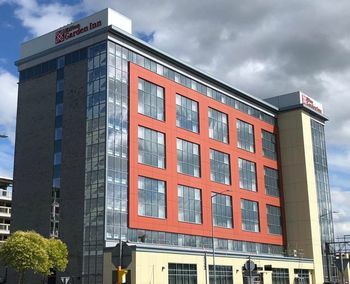 Hilton has opened a new Hilton Garden Inn at Birmingham Airport. Important, this hotel is directly at the airport, next door to the passenger terminal. No shuttle buses etc required. It’s not going to win any architectural awards (see picture below) but apart from that it seems to be a great option. I saw rates as low as £65 per night for November, although I can also see dates where it goes over £200! In terms of convenience, however, you can’t go wrong. It could also be a cheap option for visitors to Birmingham itself. It is a short walk from Birmingham International railway station and there are very frequent trains into Birmingham New Street for the city centre. The Hilton Garden Inn Birmingham Airport website is here. PS. When you click the link above, the hotel does NOT look the one below. This is because hilton.com is, for some odd reason, featuring a hotel in Birmingham, Alabama! Chauffeur group Blacklane has extended its offer of 10 Miles & More miles per €1 / £1 / $1 spent on rides to the end of October. Your ride can take place until the end of 2018 as long as the booking is made this month. The company now operates in 300 cities in 60 countries and is particularly useful for airport rides. We used them in Milan Linate in August and it was good to have the driver waiting at the gate with our name on a board. There is also a hotel partnership coming soon but I am sworn to secrecy on that. You can save 10% on your first Blacklane ride with code SAVE10%. Blacklane has a slightly odd way of entering promotional codes. You will be presented with a page asking for your credit card details. After you type them in, there is an additional screen which asks if you have a voucher code. Add SAVE10% on that page and 10% is deducted from your quote. Your card is not charged until after the ride and you can cancel until 1 hour before pick-up. You can sign-up for a Blacklane account here. Click on the Miles & More logo on their home page to see full details of the ’10 miles per £€$1′ offer. OT I remember reading here that BA was refunding non-refundable flights booked during the data breach period. I cancelled an avios redemption booked during that time, so got the avios back and wrote to BA to get them to refund the £35. I generally don’t accept answers like this as ending the matter. HUACA is good advice, ie get a better response from somebody else. Go senior – senior people don’t like dealing with sh!t like this, particularly if there’s precedent saying others have been compensated fairly in similar circs. Ultimately £35 is a ridiculously small amount for a senior person their end not to say OK to, given the data breach. As you may remember, I insisted on getting 5000 Avios back (each) on the cancelled F&B on RFS flights – I’d bought & paid for them in advance. Not so dissimilar to your £35. Mr Cruz (or his office) came up trumps, it was an obvious unfairness – whilst I fondly imagine Mr Cruz reading my case email and saying: zees Mr Shoestring ‘e ‘as a point, let them ‘ave zer 5000 Avios, we stoppa’d ‘im from ‘aving a cerveza and snecks on ‘ees RRRRRRRFS flights – it was probably all dealt with by a smart secretary. Why wouldn’t OP just say they were cancelling due to data breach? Yes, I said I was cancelling due to the data breach. I have just sent them a reply threatening with legal action. Consumer Rights Act 2015, section 49(1) is mentioned in the email. Every contract to supply a service is to be treated as including a term that the trader must perform the service with reasonable care and skill. OT – can Harrods gift cards be used in the Apple substore? Yes, unless it has changed since May. Call the Apple Store and ask for up to date situation, that’s what I did and guy was helpful. Yes. It isn’t a sub store anyway, it is fully integrated into the tech department – at least it looks that way.